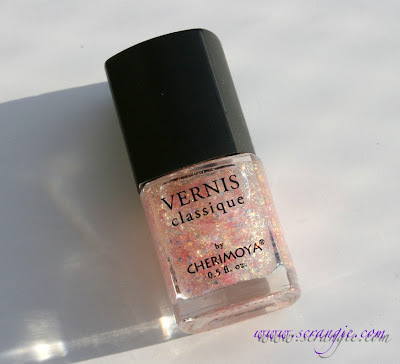 Vernis Classique by Cherimoya in Electric Heaven (over grey polish). Here's an older picture that I forgot I had. 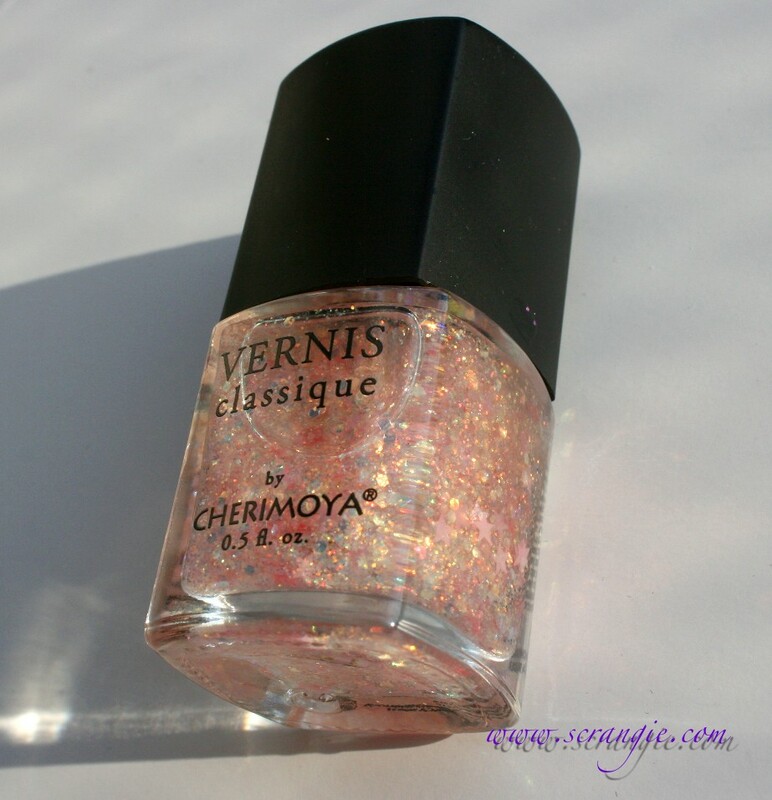 It's was one of the handful of Cherimoya polishes I picked up at the same time as Metallic Purple. Electric Heaven is an absolutely gorgeous polish. It's a sheer layering-type glitter that has lots of different shapes and sizes of translucent pink-orange based iridescent opal glitter plus big pastel iridescent stars. All the glitter is set in a peachy-pink tinted base, but it applies clear with only the barest hint of color. Yes, it smells bad. Yes, it's thick. And the brush is just silly. But damn if this doesn't look good over every single polish I've layered it over. It even looks good by itself as long as my nails aren't too stained (a coat of Color Club Milky White French Manicure base coat tends to fix that). To me it's worth having on hand just to look at how pretty it is in the bottle. It's like a magical star-filled snow globe. I don't remember how much I paid for this, but I don't think it was over $4. It came from Walgreens, but they haven't had a Cherimoya display since I originally picked this up. Oh, wow! That is gorgeous! I wish they still had it at Walgreen's, I've never seen anything quite like it. I love it except for the stars. I'm not a fan of super-large glitter; it always makes me feel like a kid wearing it. But the smaller glitter in it is beautiful! Nice find, and gorgeous swatch! I love odd little gem of nail polishs that you can find sometimes. In high shool (about 10yrs ago...eik!) I had a np bottle in the shape of a cat sitting. Inside the np was a blue jelly with square holo glitter. My sister got it for me, and I have no idea where it is today. KleanColor Aurora is a good dupe of this. Love how those stars lay flat. It looks very girly and cute. OMG!! The stars are so cute!!! I live in Sweden, do you know any site that ships this brand internationally..? Oh goodness, this is lovely! I'll have to see if this is available online anywhere. oh this is cute. love the combination! I just left Walgreens, where they had the new Wet n Wild Fergie polishes, have you seen them yet? The reason I mention ir on this post is because there is one called Hollywood Walk of Fame, which is multi colored stars in a clear base. Looks really awesomel in the bottle but I imagine it would be a PITA to place all the stars. I picked up two from the collection, a black and gold glitter and a red and holo glitter. I think you'd like some of them! Cute glitter! I've never seen this brand before. This is lovely and I am one of those not madly in love with glitter - hate grit/chunky - hate getting it off. Wondering if just some areas of the US carry this brand at Walgreens? I never have seen it at any Walgreens in CA. 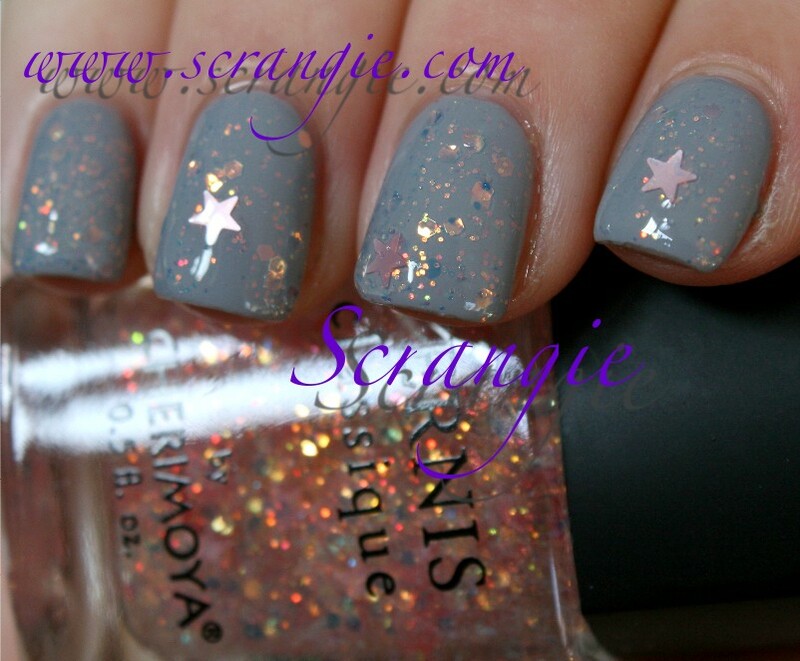 It looks so dreamy over the grey - great and unexpected colour combo, Scrangie! I've never heard of this colour before, and I have nothing from that brand. Cool! This definately looks like Aurora from Kleancolor, which smells bad too and is thick as well. Probably the same polish in different bottles? Just ordered a bottle from eBay. It looks gorgeous. Just ordered a bottle from eBay for super cheap. It looks gorgeous, I think it might be worth the trouble. Oh wow, this is a gorgeous polish! Annnnnnd I just went to eBay. Found a set w/ two Cherimoya polishes--had the color Electric Heaven (that you swatched here) and a shade called XTC, together for $3.99 ... yeah, s&h is $4 but paying $7.99 altogether for two polishes isn't too bad when plenty of single bottles of polish cost that (or more)! You are an enabler. A horrible, lovely enabler. I have this Polish....they dell it here in the Bronx for. 99.